Marvel fans are still reeling from the cliffhanger ending at the end of Avengers Infinity War. The Avengers take on Thanos as he hunts down the six infinity stones, but as all hope is lost, who is there to step in and save them? A post-credit scene hints at one of the most powerful beings in the universe making her way to the MCU, but who is she and is she powerful enough to stop Thanos? The cliff-hanger ending from Avengers Infinity War leads into a telling post-credits scene with Nick Fury (Samuel L. Jackson) and Maria Hill (Cobie Smulders), desperately trying to survive. Fury, in his final moments, grabs a retro-looking pager device from his car and presses a button. The old-fashioned pager drops to the floor, showing a “sending” message on the screen before a strange insignia appears in front of a blue and red logo. The logo represents one of the most powerful heroes in the entire Marvel Universe – Captain Marvel. The comic superbeing is expected to play a major role in the future of the MCU but what is she capable of? 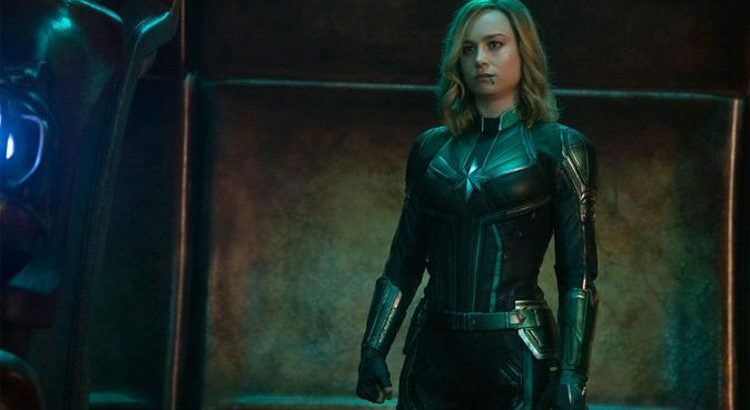 Captain Marvel, also known as Carol Danvers, is yet to be featured in the MCU but holds the ability to reverse everything that Thanos has done. Carol Danvers, previously a pilot in the US Air Force, has an unfortunate altercation with a Kree alien called Mar-Vell, giving her untold cosmic power. She has been known to have enhanced durability, strength, speed and the ability to fly. Danvers can also fire energy projectiles from her hands. Possessing a keen military mind, Captain Marvel is a born leader who will be looking to round-up the remaining Avengers to take on Thanos once more. The Captain Marvel film is rumoured to be set in the 1990’s telling the origin of her powers, as well as her connection to Nick Fury and the rise of S.H.I.E.L.D. Releasing just 2 months before Avengers: Endgame, fans are expecting the solo outing to set up the next phase of the MCU. Is Captain Marvel the strongest Marvel character? Strength in the Marvel universe is a difficult thing to define, given the wealth of powers that some superheroes have. In terms of sheer raw strength, she is not the strongest. Captain Marvel is exceedingly strong, capable of lifting weights many times that her own, but she is no match for the likes of the Hulk. But power is not just based on strength. There are a whole host of factors used to decide a character’s power. So far in the Marvel Cinematic Universe, we have met a whole host of cosmic beings who have the ability to travel through space, wield the elements and destroy entire planets. For example, Odin, Thor and Loki’s father, and King of Asgard has the ability to wipe out entire races, travel through time and is rumoured to be nigh invincible. CAPTAIN MARVEL AGE RATING: HOW OLD DO YOU HAVE TO BE TO SEE IT? Thor himself, freshly equipped with his new god-killing hammer, StormBreaker, is also no slouch. Wielding the power of thunder, Thor can teleport through space and nearly take down a fully powered Thanos. Doctor Strange is also a significant contender, able to see into the future and change the past, his magic is capable of taming even the most powerful beings like the inter-dimensional destroyer of worlds, Dormammu. There is even speculation that the MCU could move onto a much bigger threat, in the shape of Galactus. In the comics, Galactus is capable of eating entire planets, making him one of the most powerful beings in the entire universe, but he is yet to be even hinted at in the MCU. Captain Marvel, however, is capable of much more, given her secret weapon. Will she wield the secret stone? Fans speculate that Captain Marvel will wield a secret seventh stone, that holds all the power of the previous six in one. The seventh stone is yet to even be mentioned in the MCU, but fan theories on the hidden gem swirl the internet in the build-up to Avengers Endgame. Known as the Ego Stone, the gem has the power to turn Danvers into the most powerful cosmic being in the universe. Reddit user TruthOfAlecius theorised: “She [Captain Marvel] is even believed to have a seventh sense. “That’s very interesting because there is an actual seventh infinity stone in the Marvel comics, the Ego stone. With or without a seventh Infinity Stone, Captain Marvel is very powerful and this theorist, who thinks Thanos’ click actually created two alternate universes rather than killing everyone, reckons she could put them back together. The theorist continued: “So what if she is actually so powerful that she is capable of holding the two alternate universes in place for a long enough time to where the Avengers can assemble once more in a single universe and come up with a plan to defeat Thanos by getting Gamora out of the Soul Realm? Fans will have to wait to find out just how powerful Captain Marvel is, as her solo outing is not scheduled until March 2019, but expect a whole new level of power to be unleashed on the MCU next year.